It might sound strange, however ginger is one of the flavors, which is working fantastically in mixed drinks. Especially with aged spirits, it really shines. 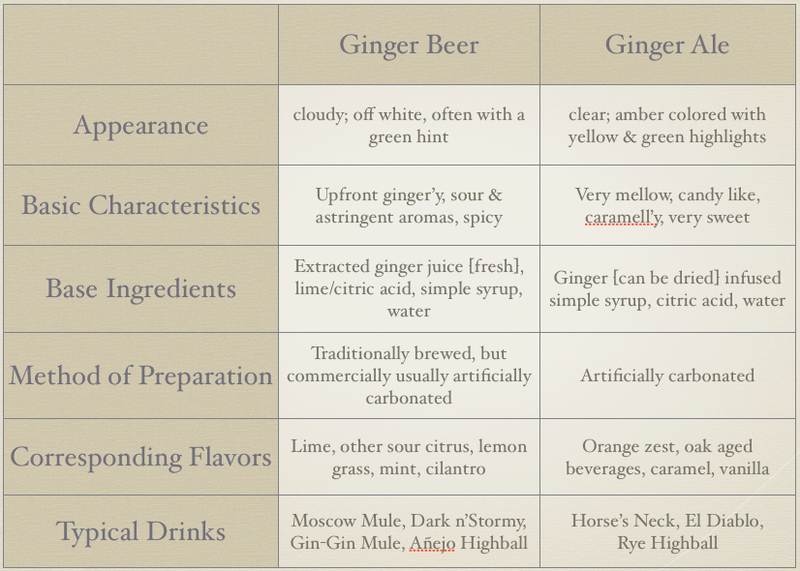 But even white spirits you can combine with ginger - hence it might be one of the most versatile flavors in the bar. 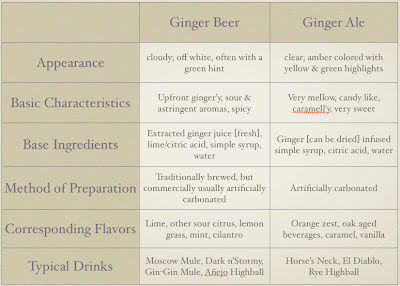 There are different beverages carrying the aroma ginger - ginger liqueur, ginger syrup, fresh ginger which you could muddle, but the most common ones are ginger ale and ginger beer. But what are the differences between those two? One can be sure, that ginger beer was the first concocted ginger beverage. An interesting note is the traditional preparation. The strained liquid [you may call it juice], from fresh grated ginger, was combined with water, citrus juice and simple syrup and was fermented. 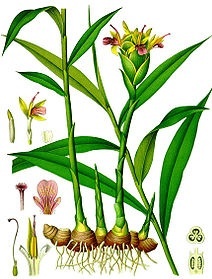 However originally no yeast, but ginger beer plant was used. This ginger beer plant [usually abbreviated to gbp] is a composite organism - a in symbiosis living microorganisms- bacteria and yeast [lactobacillus hilgardii & saccharomyces florentinus]. It could be compared to the mother of vinegar - or even more with kefir or kombucha substrates. And yes, as yeast alone, gbp produces alcohol and CO2. Long time, ginger beer was the beverage to go. However with the commercialization of beverages [and the production in regions, where no fresh ginger was available], it finally evolved to ginger ale, which was no longer brewed and which was sweeter and less spicy. It is always good to know the origins. But if we are nowadays talking about ginger ale and ginger beer, what are the actual differences? I think both beverages are working very well in mixology, while ginger beer is for the moment the trendsetter, I am sure, that ginger ale will soon celebrate its revival! Ginger ale against this is more subtle. It is rather supporting the aromas of the companion, than fighting them. I always prefer ginger ale, when I would like to combine it with a nice whisk[e]y, aged rum or aged or rested tequila. One more interesting point is, that you make them both easily at home. To be honest, I am a fan of non-alcoholic ginger brews - just because it is much easier [otherwise you have to be careful, that your bottles won't explode]. For the fairly traditional and forced carbonation methods of making your ginger beer, just check out Jeffrey's post about it. If you would like to make ginger ale, be much more subtle with your ginger. Dried ginger [no powder - this is difficult to filtrate], is an advantage - but you could also use fresh ginger. Cut the ginger very coarsely and infuse simmering simple syrup with it. You can also add orange peel, cinnamon, vanilla bean, celery seeds to it - however don't overdo it - you want to make a ginger ale, not a cinnamon-vanilla soda. After the syrup has cooled down, strain it, dilute it and carbonize it. Another tip would be, to use the syrup and oak age it for a couple of weeks. This would be the perfect companion for any aged spirit - and even on it own a real gourmet soda. Schweppes Ginger Beer - not as easy to find then Schweppes ginger ale - but spicy, round and quite sweet. Schweppes Ginger Ale - very common - not really tasting like ginger - more like herbal candy. Still - not bad at all - a bit sweet. Canada Dry Ginger Ale - ever encountered an order of Canadian Dry? I had a couple of guests who did - and they meant Canadian Club whisky and Canada dry ginger ale. This ginger ale is not as sweet as the Schweppes, but also doesn't have much of ginger taste. Schweppes [or home made ginger ale] is a good substitute, as the »dry« doesn't really refers to the sweetness but to the style - please see below in the update. Bickford's Old Style Sodas Ginger Beer [ginger soda] - Bickford is also a archetypal ginger beer with strong ginger notes. It is a bit artificial tasting [ginger has tendencies to change its flavor], but it is still all good. Definitely worth a try [besides of Bundaberg, Bickford is coming in small glass bottles, which are looking much better than cans. Elephant House Ginger Beer - one of the less pronounced ginger beers around. Not bad - but not necessarily great either. Comes here in the Middle East in funny elephant cans. Fever-Tree Ginger Ale - one of the best commercial ginger ales available. Only made with natural ingredients, it is quite smooth, but still has a reminder of ginger in it; just the right balance. Can only disappoint due to its low carbonation. My researches are showing, that apparently ginger ale pretty much tasted at the beginning similar to ginger beer. It was usually called golden ginger ale and it might be a rather century old Irish recipe, which was arguably "invented" or better said formulated in the US in the mid-1800's, by the apothecary and surgeon Dr. Thomas Cantrell. The ginger ale, what we rather now, was a Canadian formula of John McLaughlin. He introduced this so called "pale dry ginger ale" in 1904 and patented it as "Canada dry ginger ale" in 1907. This style became especially popular during the prohibition and ousted over the time the previous style almost completely. What about Vernors, Idris Ginger Beer and Stewart's Ginger Beer? I rate these 3 up with Schweppes Ginger Beer and prefer them all straight. Sorry - have just seen your comment now. Unfortunately I didn't tried these ginger beers. But anyway, cheaper and better are definitely home-made ginger beer, and you just need citric acid, fresh ginger, soda and sugar for it. Just a reminder, to post your name, if you are commenting! Personally I am not that much for Fever-Tree. I think they are not bad, but the taste isn't that different of more commercial mixers like Schweppes - plus the carbonation is quite weak, the last time I checked!